The third NorAm weekend of the season was also Canadian selection trials for 2019 World Nordic Ski Championships and a Quebec Cup event on the Bishop’s University trails in Lennoxville, which is a neighborhood in Sherbrooke, Québec. With variable weather the Mont Orford club rallied and held races all three days of the competition schedule. 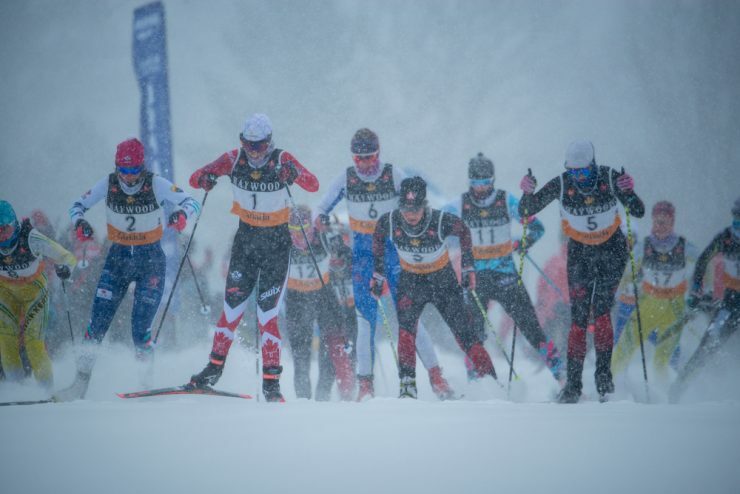 On the line were NorAm series points, COC leaders’ bibs, and six automatic selections for the World Championships in Seefeld. Four athletes have been pre-selected for the World Championships: Alex Harvey (PyeongChang, WC period 1), Lenny Valjas (PyeongChang), Dahria Beatty (WC period 1), and Emily Nishikawa (Tour de Ski). The race winners from each day would join that group. 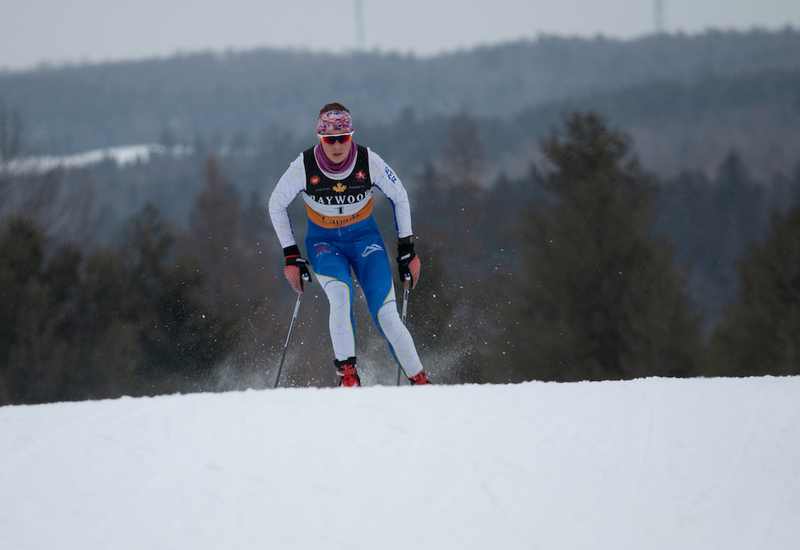 Racing began Friday with skate sprints on a technical course. The weather cooperated, with -10 C air, dry snow, and snow flurries. Maya MacIsaac-Jones (CNST) took the first selection, along with the qualifier and every heat, winning the 1.3km A final in 2:36.83. Katherine Stewart-Jones (CNST) was second (0.05) while Laura Leclair (Nakkertok) earned her first senior NorAm podium at 3.77 seconds. The men’s 1.6km sprint final was more aggressive, with Evan Palmer-Charrette (Team R.A.D.) winning in 3:06.58, edging out Julien Locke (CNST) by 0.11 seconds at the line with early leader Russell Kennedy (Team R.A.D.) 2.26 back in third. The individual start classic day dawned cold, but a delay to a noon start allowed legal racing at -19 C with less wind. 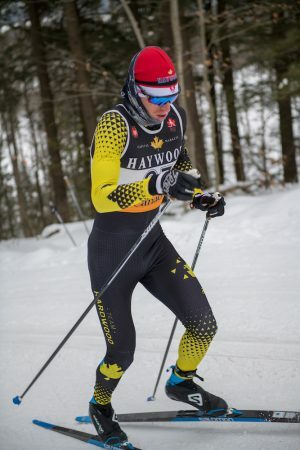 Scott Hill (Hardwood) won the men’s 15km and earned his trip to Seefeld with the fastest splits on the last three laps, with Kennedy fading on the last lap for second, 9.0 seconds back. Graham Nishikawa (CPNST) held on for third at 38.0 seconds. 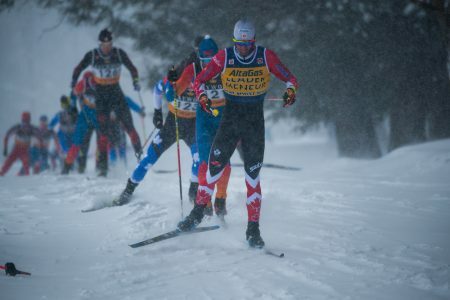 Stewart-Jones won the women’s 10km, earning the selection spot along with the virtual COC leaders bib. Cendrine Browne (CNST) was second at 30.8 seconds, an improvement from her 4th on Friday. 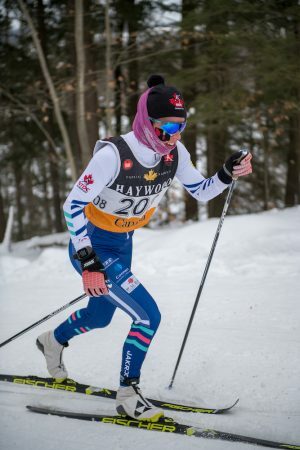 Zoë Williams (Nakkertok) was third at 1:53.5, edging out Frederique Vezina (CNEPH) by 3.1 seconds. Athletes from the east were less likely to comment on the cold than the westerners. All names withheld to protect the guilty. Sunday was warmer as a massive snowstorm rolled through Quebec. The trails became softer and deeper as the day progressed despite the shortened courses. Katherine Stewart-Jones (CNST) continued her dominance with a win in 48:25.5 minutes, on a shortened course of 14.3 km, with one 4.3 km lap and two 5 km laps. COC leader Russell Kennedy (Team R.A.D.) collected his first win of the weekend to earn his trip to World Championships, finishing alone at 57:12.6 on the four lap 19.3 km race. Hill was second at 23.4 seconds behind. Palmer-Charrette out-sprinted the remains of the original six leaders to complete the podium at 1:07.0. 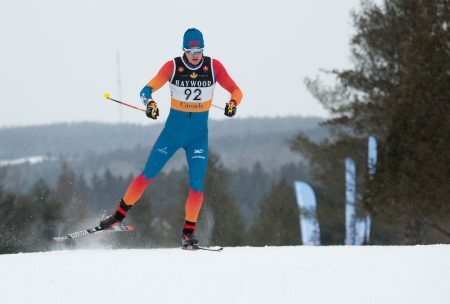 At the end of the weekend, MacIsaac-Jones, Palmer-Charrette, Stewart-Jones, Scott Hill, and Russell Kennedy have met the qualification standard for Seefeld. The High Performance committee should soon announce their official selection; if there is a sixth athlete chosen, it is likely to be Browne with 4th, 2nd, and 2nd places. Kennedy continues as COC leader while Stewart-Jones moved past Dahria Beatty to earn the women’s leader bib.